As the 2019 Lok Sabha election is less than a month away, Congress’ General Secretary in-charge of UP East, Priyanka Gandhi Vadra will start her poll campaign today from Prayagraj and in an open letter, she has said to reach people’s doorstep via Ganga. As PM Narendra Modi started off his political campaign back in 2013-14 from Varanasi, claiming that ‘Mother Ganga has called him,’ Priyanka Gandhi Vadra has referred Ganga river as the epitome of ‘truth’ and ‘equality’. Adding to her thoughts, Priyanka also said that no substantiate change can come until the political leaders start listening and sharing the problems. “I am associated with this land spiritually. I believe that no political change can begin without listening to your problems or sharing your problems. That is why, in order to establish a truthful dialogue with you, I am reaching your doorsteps,” Priyanka Gandhi Vadra said in the open letter. 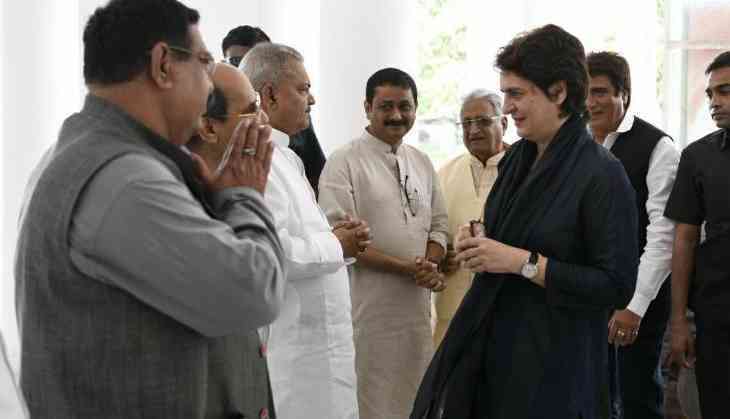 Priyanka Gandhi reached Lucknow on Sunday and held meetings with the office bearers as well as several delegations. As per media reports, she is scheduled to board a boat at Manaiya area in Prayagraj and she will be interacting with the communities which live nearby river (mostly Mallahas) and students as weel. Thereafter, she would tread towards the ghats in Sirsa, Lakchhagrih as well as Sitamadhi.